Our condolences go out to the Barrick Family on the passing of Morris Barrick. Morris was a lifelong Flemington resident and was the track electrician for Flemington Speedway for many years. Morris' son Steve Barrick created and operates Program Dynamics (PDI), and is also the Assistant to The Editor at Area Auto Racing News. Morris Barrick is survived by his wife Carol and sons John and Steve. Our sincere condolences go out to the Barrick Family at this difficult time. Photo provided by Ace Lane Jr. Sad news has reached us that modified racer Ken Wismer Jr. has passed away. 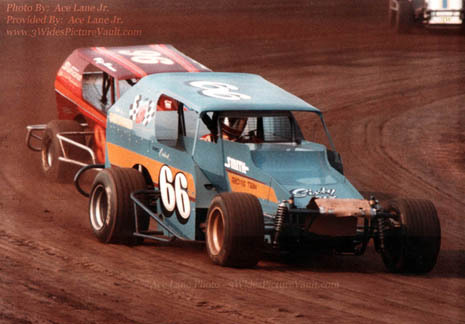 I remember Ken driving the blue #89 at Flemington in the modified division, and I'm sure that fans will remember Ken racing in a variety of cars at many of the area speedways. 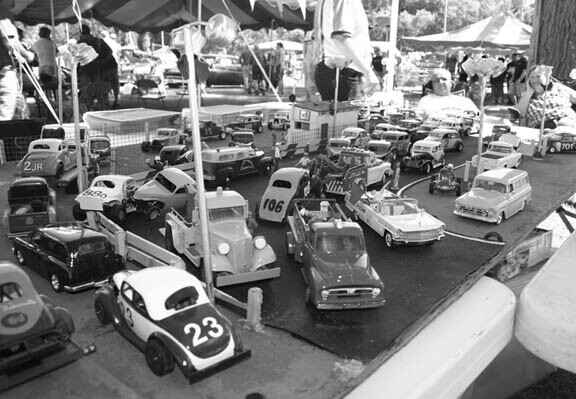 Our condolences go out to the friends and family of Ken Wismer Jr.
Dan Rhein with the diorama that he created of Old Bridge Speedway on display at the 2008 Warren Township Car Show. Many have friends in the racing community, but I don't think I know anyone that had more really good, close friends as Dan. When Dan's friends mentioned him, they wouldn't just say "Dan", but instead would always refer to him as "my good friend"... or "my best bud Dan" when talking about some place they had gone with him, or some project they had worked on together. He was that kind of guy. The racing community, and all those that knew Dan Rhein are all saddened by his passing. 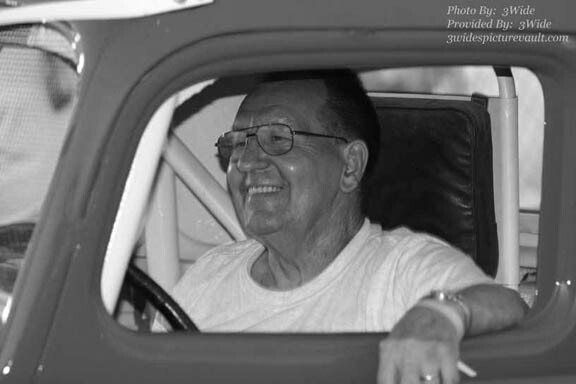 We will always remember him through the stories, the friendships, and through his dedicated efforts to provide all of us, and those that will follow, the history and the memories of Old Bridge and other local speedways. My condolences go out to the family of Dan Rhein. 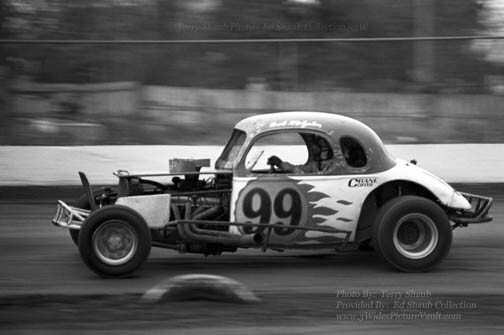 Racer Joe Cryan shown above behind the wheel in this 1958 photo from Nazareth Speedway. 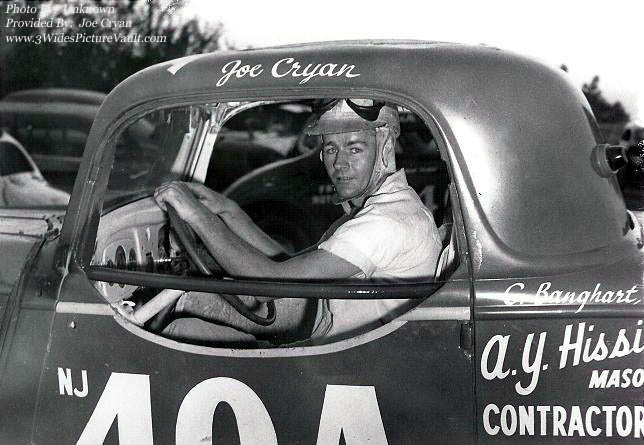 Our condolences go out to the family and friends of Joe Cryan. Gary Butler, Big Artie and the #68 Team celebrate in victory lane after Gary took the win in the season ending $10K to win "All Star Cup Shootout" Feature Event at New Egypt Speedway on Thursday, Oct 3rd. 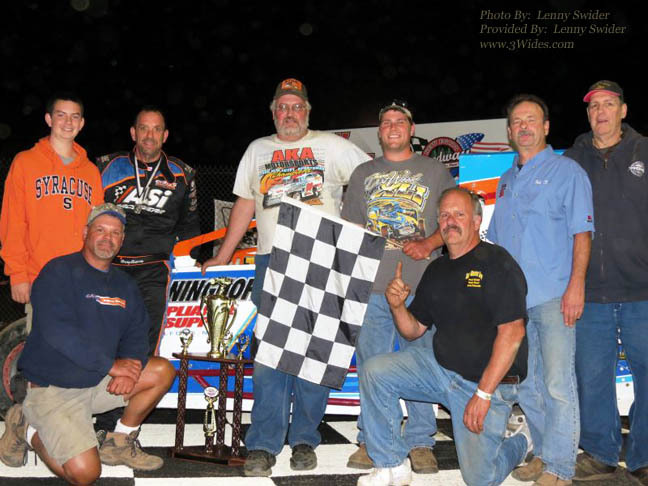 Gary (who has won championships in different divisions and many feature events since the 80's) wrapped up possibly his best year ever behind the wheel of a modified, with multiple feature event wins in 2013, and now, a victory in the $10,000 to win event. Congratulations to "Good Guy" Gary Butler, and the entire #68 team! "Gary, Big Artie and crew. What a great end to a fabulous year. Hard work does pay off. Proud to be associated with "The 68" - Till next year, Congratulations from the 25 smiling faces @ G&G Diesel Service!" Steve's driving career began in 1950 and it wasn't until 1968 that Steve hung up the goggles. During that career he drove a variety of cars for many different owners. Often you could see Steve behind the wheel with his trademark cigar clenched between his teeth. Steve often posted comments to the pages of our site as well as on our Message Board. Steve was our direct link right back to the cockpit of the cars from those amazing decades that 50 plus years later, we all love to look at and talk about. He was the history. I last saw Steve at the 2012 South Jersey Racing Reunion with Racing Historians Ralph Richards and Russ Dodge and got to sit down and talk to Steve for quite a while. In addition to talking about racing, Steve and I talked about technology, and about how much RAM his latest computer had! Not one to shy away from technology, Steve expressed what a shame it was that a lot of other folks from back in the day refused to use computers and about how much he depended on new computer to keep up on everything. When asked about his career, Steve had said, "I had a good time racing. 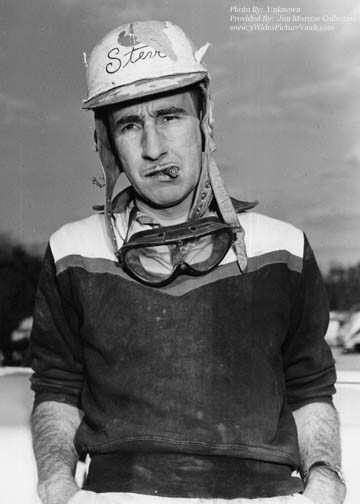 I didn't get rich but I ended up winning 6 Track Championships, 38 features and over 150 heat races." Steve was inducted into The National Old Timer's Hall of Fame in 1999 and inducted into the Garden State Vintage Stock Car Club (GSVSCC) Hall of Fame in 2002. This is the toughest part about running a site like this as it's times like this when we are at our saddest. But it's also times like this that I am grateful for ever having the opportunity to meet the real Legends of our sport. Steve Elias is a true Legend. My sincere condolences to the Elias Family and to the friends of Steve Elias. 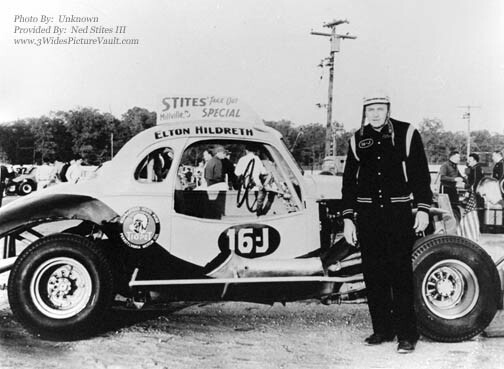 (Sept 2, 2013) We received word that Elton "Wildman" Hildreth has passed away at the age of 95. A favorite from South Jersey who raced at all of the area speedways, and who also ran at many many other speedways, and even on the beach at Daytona. Elton's accomplishments, and the exciting way he lived life will keep him forever in our minds. Thanks for taking us along on that incredible ride. 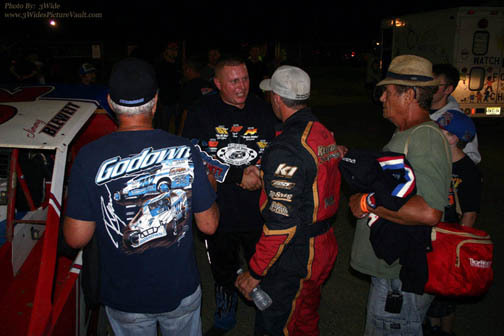 Jimmy Blewett accepts congratulations from 3rd place finisher Duane Howard after winning the Friend's of Mike Event at Bridgeport Speedway. 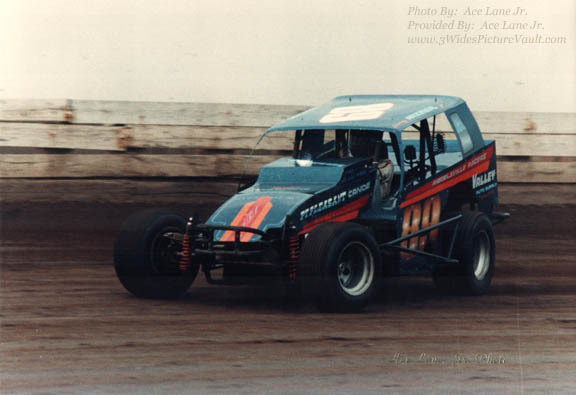 Fred Orchard Jr., shown above in Modified competition in the mid 80's at Flemington Speedway, has passed away at age 56 after a 14 month battle with cancer. His viewing is set for Tuesday in Chester, NJ at the W.J. Leber Funeral Home. Viewing hours are 2 to 4 or 7 to 9. He will be buried on Wednesday at 11 am. We join the racing community in mourning the loss of Fred Orchard Jr. 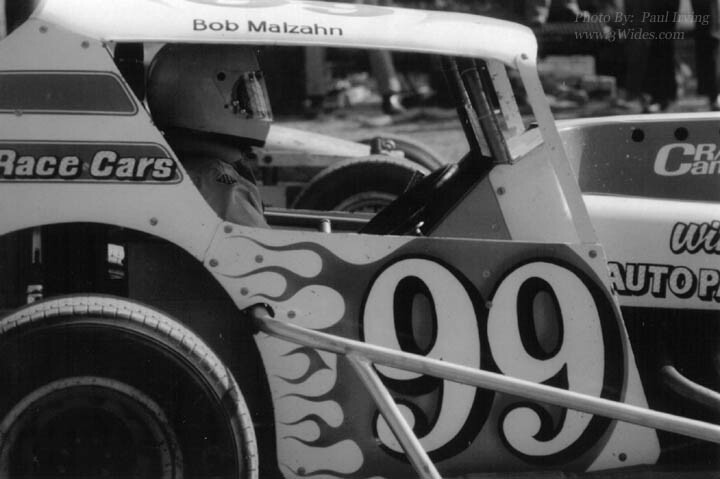 The sad news has reached us of the passing of racing great and fan favorite Bob Malzahn. 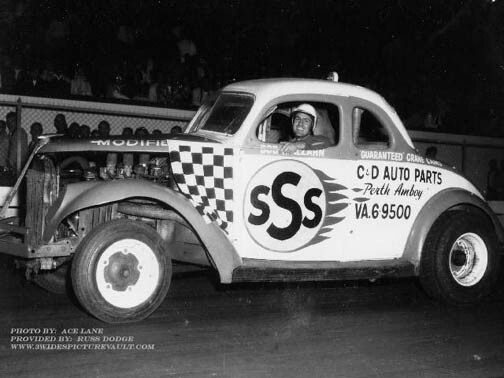 Bob drove many cars over a career that spanned 5 decades including the #SSS and the trademark "Fireball #99". The racing books will record all the wins, but we will always remember the gentleman racer with the big smile, Bob Malzahn. Our condolences to the friends and family of Bob Malzahn. 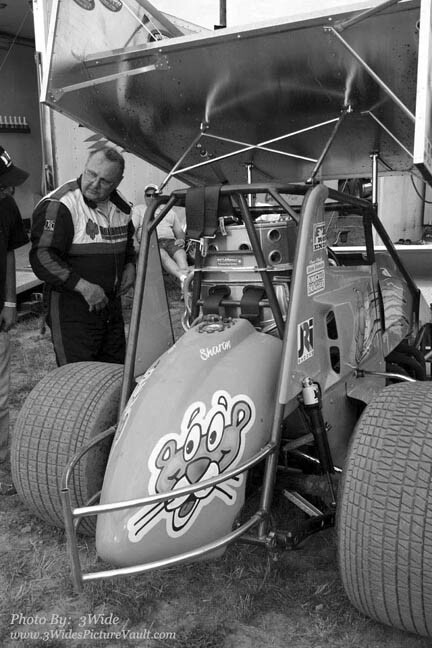 Kramer Williamson next to his Pink Panther sprint car at New Egypt Speedway during a URC event in this 2012 photo. We have received the very sad news that Sprint Car driving legend Kramer Williamson has passed away from injuries sustained from an accident that occurred during a qualifying event at the Lincoln Speedway on Saturday, August 3rd. 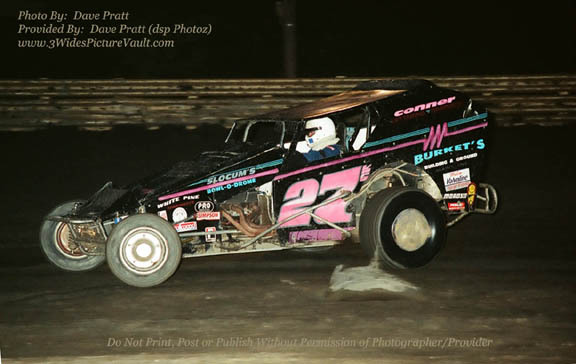 A racer, a champion and always a fan favorite, Kramer Williamson and his highly recognizable "Pink Panther" racer will be in our mind and in our heart's forever. Our condolences go out to the friends and family of Kramer Williamson. Rest in Peace. Sad news has reached us of the passing of Ed Shaub. Ed was a good friend and a huge help here at The Vault. 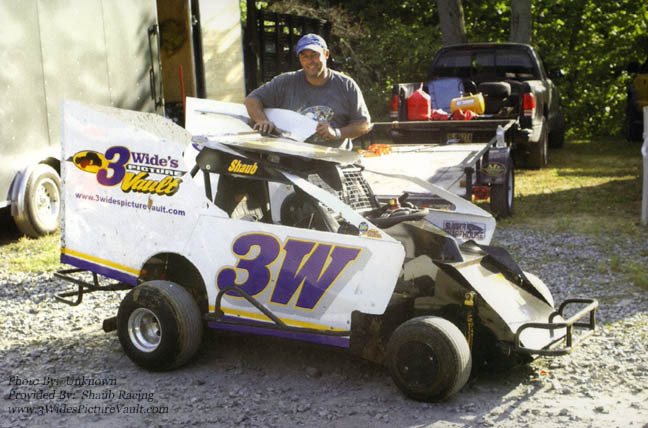 A few years ago, Ed decided to fulfill a life long dream to race and did so by fielding the #3W as seen above at some of the area speedways. Ed did us proud, flying the colors of our website, and enjoying meeting folks through his racing. With his FairgroundsRacingPhotos Website ( www.FairgroundsRacing Photos.com , Ed helped to preserve the history of the sport by digitizing and displaying his father Terry Shaub's photo collection featuring action from the Reading Fairgrounds in the early to mid 70s. These images may never have been seen if it wasn't for Ed's efforts. Ed was always doing things for others. He was that kind of guy. We will miss our friend. Rest in Peace Ed Shaub. 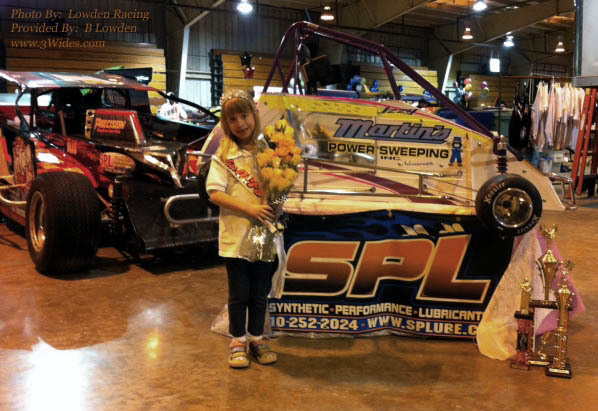 1/4 Midget Racer Izzy Lowden was the winner of the Tire Changing competition and the Little Miss OCFS contest at this weekend's OCFS Motorsports Show on Saturday, "Best Booth" on Sunday, and 2nd overall for the show. 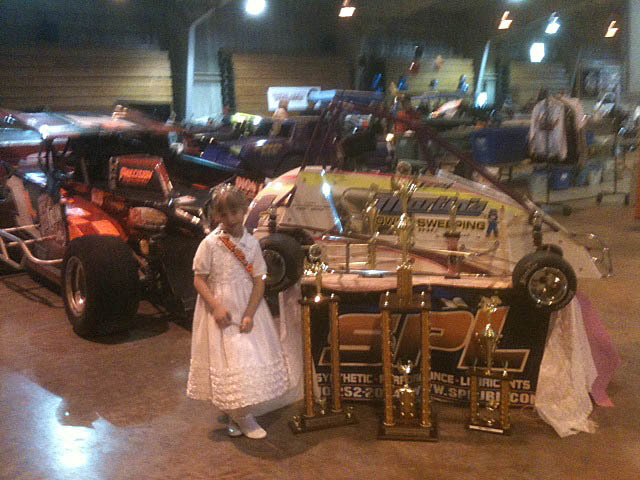 Congratulations Izzy on your weekend at the OCFS Motorsports Show! Izzy's racer is sponsored by SPL Synthetic Performance Lubricants www.SPLube.com and Martin's Power Sweeping. Sad news has reached us that car owner Bob Burket has passed away. 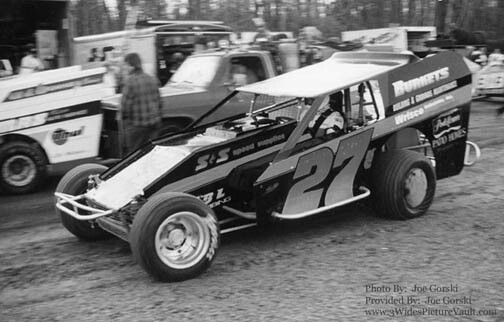 Bob's familiar #27KC cars, with drivers Chip Slocum, Joe Zuczek, Mark Bitner, Wade Hendrickson and others could always be found running up front at such tracks as East Windsor, Flemington (80's & 90's) and then later on the clay at New Egypt. 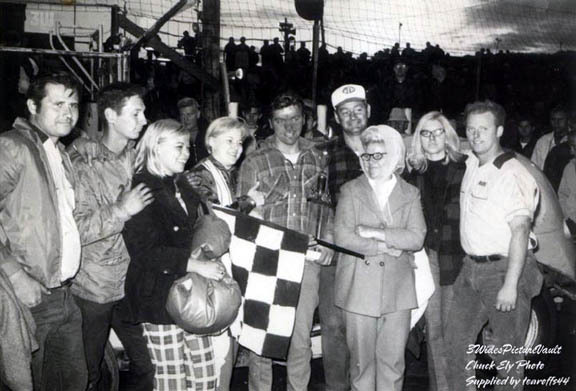 Bob Burkett (left) in victory lane with Stan Ploski in this 1969 Chuck Ely photo (provided by Mark Yaple/Ron Blake.). Prior to becoming a car owner, I'm told that Bob was Stan Ploski's "right hand man" back in the 60's and early 70's. Our sincere condolences to the friends and family of Bob Burket. 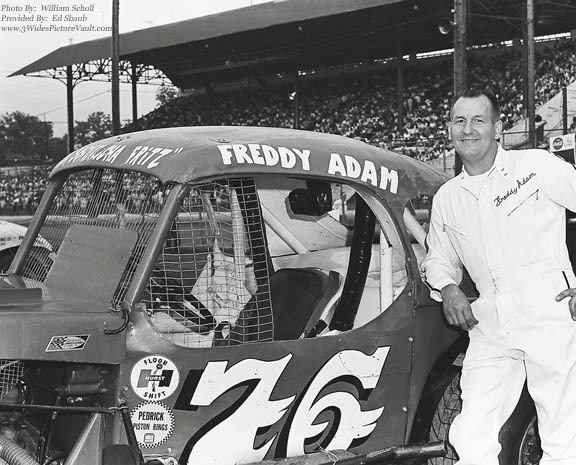 Freddy Adam with the #76 at Reading Fairgrounds (top) in this 1960's photo (provided by Ed Shaub), and Freddy behind the wheel of a vintage coupe at the 2006 Reading Fair. Our condolences go out to the friends and family of Freddy Adam.